Obviously, no one gets filthy rich on a teacher's pension. What is "defined contribution" in a pension? What is a "defined benefit" in a pension? How are teacher pensions different? Why don't teachers get Social Security benefits? Is the teacher pension system safe? Why does the stock market matter for teacher pensions? Who pays for teacher pensions? What does 2% at 62 mean? Teachers aren't lavishly paid, but each year of teaching comes with a significant promise toward a financially secure retirement. It is easy to underestimate the value of the pension system in the "big picture" of teacher compensation. Teachers' pensions in most states, including California, are "defined benefit" systems. That is, when a teacher retires, he or she receives payments in a manner defined by the rules of the pension system. Those rules involve factors beyond the amount he or she has paid in. Most workers pay into Social Security. California government workers pay into CALPERS. California Teachers pay into CALSTRS. The pension system for teachers is a "defined benefit" system, like Social Security. The amount you get out of a defined benefit system in retirement does not directly connect to the amount that you pay in. While working, you pay the system. When retired, the system pays you. The amount that the system pays out is determined by a formula that blends your pay when you retire, your age when you retire, and the number of years you work as a teacher or administrator in the STRS system. Superficially, STRS resembles Social Security. A portion of teachers' gross wages is withheld from each paycheck. After retirement, they receive payments from the system. As with Social Security, teachers receive larger payments from the system if they retire older than if they retire younger. There are differences. The Social Security system doesn't differentiate the age at which you make your money, the kind of work you do or the number of years you have worked in a particular profession. These are central factors in the California STRS system because it has a particular mission: it is engineered to provide a strong pension for those who make teaching their life's work. 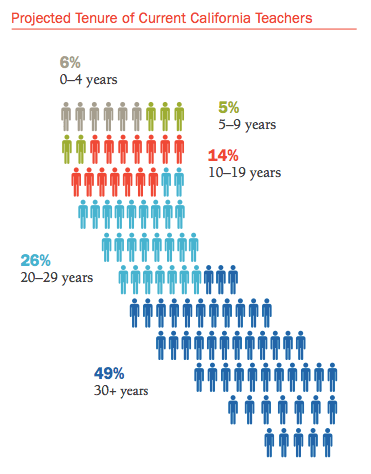 According to STRS, about half of California's teachers stay in the profession at least 30 years. In the private sector, many employees commit a portion of each paycheck to a personal retirement savings accounts such as an IRA or 401(k) account. This approach is known as a "defined contribution" model. Teachers can use defined contribution accounts, too, but the main pension system for teachers, the State Teachers Retirement System (STRS) is a defined benefit system. 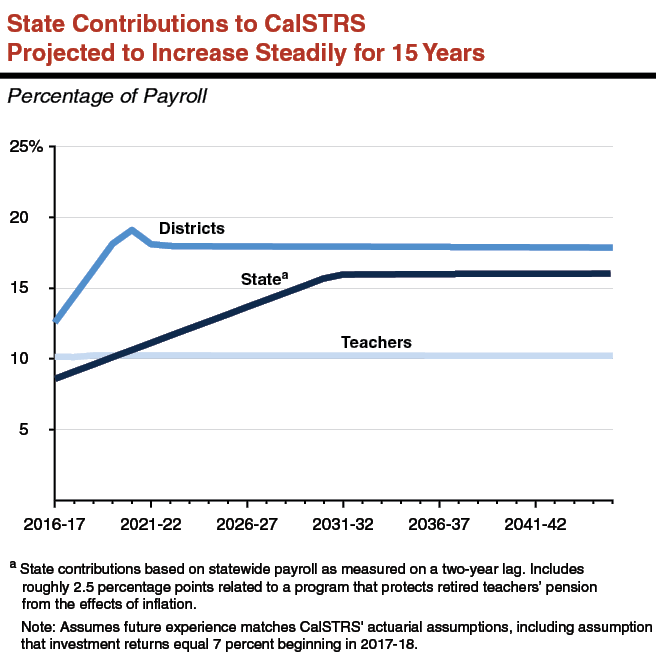 California's teacher pension system has gone through significant changes over time. Recent policy changes tweaked the system in particular for teachers hired after Jan 1, 2014, who will retire decades from now. The new pension schedule for these young teachers is known as "2% at 62" because those who retire at age 62 receive an annual retirement benefit of 2% of the average of their last three years' pay for each year they paid into the system. The chart below shows how the new schedule works for "Bee", an imaginary freshly-minted teacher in Oakland Unified. In this example, Bee begins teaching in California at age 29 (the national average — though the median is 26) with a Bachelor's degree. Ten years later she has earned 60 graduate course credits, which raises her salary (See Lesson 3.8). She works without interruption until retiring at age 65. She draws a pension until age 86, the national average life expectancy for white women not in poverty. The columns show the portion of Bee's lifetime compensation, including both salary and lifetime pension, earned in each year of her employment. In the first four years, she receives only her salary, minus the portion she pays into the STRS system for her retirement. In the fifth year, however, in addition to her salary she earns the future right to a small annual pension for the rest of her life. The lifetime value of sticking it out for that fifth year is more than $75,000 — easily greater than the year's salary. As the chart indicates, things get really interesting after Bee turns 55. The pension formula is dramatically back-loaded. Lifetime teachers qualify for a huge portion of their lifetime earnings in their last few years of work. The pension system works a little differently for "Ava", an imaginary freshly-minted teacher in Oakland Unified who began work the year before Bee. For teachers hired prior to Jan 1, 2014 (that is, most teachers in the system), the pension system is described as 2% at 60. Many features of the system are similar for these two new teachers, but the vesting schedule is even more abrupt for Ava because of a bump in the 30th year of employment (known as the "Career Factor"). Another difference between these systems for Ava vs. Bee is the definition of "Final Compensation" in the formula that determines how much each will receive in their monthly pension check. For Ava, "Final Compensation" is defined as the amount of pay she earns in her final year of teaching. This produces a major incentive for her to boost her pay in her last year, if she can: One year of extra work for higher pay (at the school district's expense) leads to bigger pension checks for decades (at the pension system's expense). In extreme or fraudulent cases, this practice is known as pension spiking. For Bee, "Final Compensation" is the average of her last three years' pay. This provision was added to reduce the incentives to game the system. If you study the charts above, they might seem intuitively out of balance. 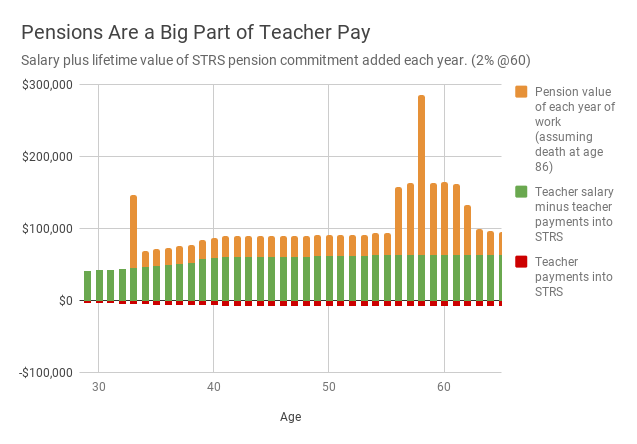 How can such small contributions from teachers (the red bars at the bottom) balance the comparatively large salary and pension payments represented by the green and orange bars? The system depends on substantial additional support from school districts and from the state. For decades, California's STRS account benefitted from some enormous advantages and a tremendous run of good luck. The most basic advantage has been long term population growth. As California added new public school teachers to keep up with growth in enrollment, the number of teachers and school districts paying into the system grew faster than the number of retired teachers served by it. Also, like all banks and funds, STRS benefitted hugely from falling interest rates and sustained growth in the stock market. For decades, teachers in California were required to contribute just six percent of their wages toward their retirement system. In the dot-com boom of the late 1990s, California's public pension systems appeared to be overfunded, so the legislature changed the math, permanently lowering retirement age requirements and raising benefits. As if on cue, the boom went bust. The pension crisis was born. The stock market collapse of 2008 added to pressures that had been building over time. California's enrollment growth had slowed. Interest rates had reached levels so low they could no longer fall. Retired teachers were living longer than the models expected, drawing pensions for more years. In 2013, California's legislature committed to a set of gradual measures to put the system on a path toward stability, a journey that is projected to take thirty years. Under this plan, more money will be withheld from teachers' paychecks. The employee contribution increases to 10.25%, higher than Social Security's 6.2% but less than the rate in other states like Louisiana, where the withholding rate exceeds 20%. The state budget commits a rising share, too; its contribution rate will double from 5.2% to more than 10%. But the plan places the biggest share of the burden on school districts. Higher state and local contributions can improve the financial health of the teacher pension system, but the money isn't coming from a magic well — it's mostly coming from school district budgets. If you hear that the state budget is going up, but your school is making cuts, now you know a big part of the reason why: the legislature broke the teacher pension system in the dot-com era, didn't fix it for ages, and now the bill is past due. This video from EdSource.org does a great job of summarizing the issues. Would a "Defined Contribution" system work better? Some argue that the best "fix" for the teacher pension system would be to abandon it in favor of a "defined contribution" system that treats new teachers and full career teachers more equally. For an example of this argument, see this analysis by the Fordham Foundation of the pension system in Los Angeles Unified. For the opposite view, read the analysis of the Berkeley Labor Center. Research into policy options for the California teacher pension system was included as part of the 2018 "Getting Down to Facts II" (GDTFII) set of studies. In Pensions and California Public Schools Cory Koedel documents the seriousness of the California pension crisis and examines policy options. "The higher CalSTRS contribution rates are not a short-term aberration," Koedel warns. "They are the new normal... the higher rates will be necessary through 2046." In reviewing the options, Koedel documents how other states have responded. Some states (notably Alaska, Florida, Washington and Kansas) have moved away from defined benefit pension models for teachers, in most cases by offering teachers a choice. Many teachers are already using other ways to save for retirement. Just as many non-teachers use an IRA account or 401k to save for retirement, on top of their Social Security benefits, many teachers set aside savings, if they can, in a "defined contribution" account. These accounts have different names than those for private-sector employees: 403(b), 457(b), Roth 403(b) and Roth 457(b). What if teachers also earn Social Security wages? A person who works part of a career in STRS employment and part of a career in "regular" employment, contributing to Social Security, may qualify for retirement benefits from both systems. There's a wrinkle. As described above, the STRS system is set up to strongly reward high end-of-career earnings. The Social Security system is set up in a roughly opposite way; it is progressively indexed to support those with low total earnings. This has a practical impact: If you pay in only a small amount to Social Security, the system assumes that you need more support. To prevent abuse of this progressive indexing, Social Security discounts STRS receipts. The interaction of these systems is complex, and some argue that the Social Security rules amount to a "hero's penalty" that discourages work. Most criticism of STRS is similar to criticism of other defined benefit pension systems. The following video explains some of the oddities that have crept into many states' systems, making them vulnerable to issues like "spiking." California's public pension systems, including STRS, are out of whack — they have made promises that they don't have money to keep. Public pension funds in some states are in even worse shape. In 2013 California began serious (and painful) steps to fix the problem. Over time, the plan will eventually balance the system unless something goes very wrong. Even if the plan works, though, it is going to hurt. It will require diverting a significant and rising amount of money away from the classroom for a long time. There isn't much of a choice, unless taxpayers decide they want to add more money to the system. Even if you see headlines that say a budget provides “more money” for California's school system, remember: the pension system has left a big hole to fill. The cost of providing special education is also expanding, along with health care costs and deferred maintenance costs for aging school buildings. A 2018 analysis by WestEd argues that the combination of these factors amounts to a Silent Recession. More money in "the budget" doesn't necessarily mean more money to invest in programs and services at your school. This post concludes the "Teachers" section of Ed100. The overall structure of Ed100 is "Education is Students and Teachers spending Time in Places for Learning with the Right Stuff in a System with Resources for Success. So Now What?" In the next chapter, we tackle the educational implications of life's most precious resource: Time. Sources: Ed100 pension model, CalSTRS Retirement Calculator, CalSTRS Member Handbook. Updated Oct 2018 with GDTFII findings. Updated April 2019 with EdSource video. One of the following statements about California teacher pensions is FALSE. Which one is it? California's pension system for teachers is separate from Social Security. Teachers and school districts both pay into California's pension system for teachers. 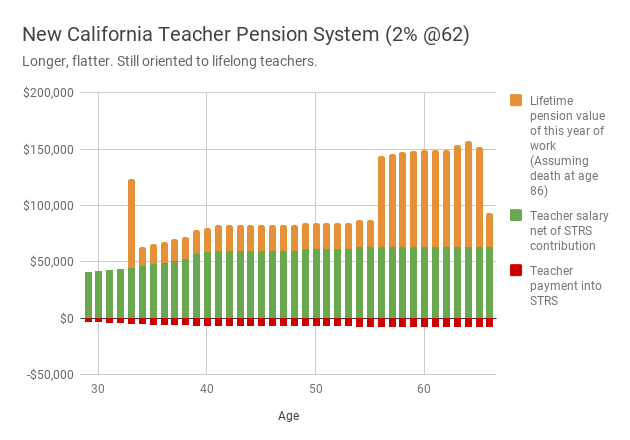 For teachers in California, more seniority means a bigger pension. California's pension system for teachers is recession-proof, and swings in the stock market don't matter. Thanks for the article. My interest is in how the amount of the pension (and other benefits) is determined. In CA, it appears the amount of the benefit was determined by the Legislature. Can you confirm that? In what states are such benefits determined by the local school board? In California, the pension rules have been set by the legislature, but health and other benefits are locally negotiated through collective bargaining. Variations can make it difficult to compare true differences in compensation between districts. In other states teacher pension systems can differ a lot. In some states teachers pay into social security and earn social security benefits. There is a LOT of money involved in pensions, so there are pretty good sources of analysis and information, but they tend to be a little siloed by system and state. In cases where there is no defined benefit system (or a small one) there may be a local defined contribution system like a 457b (see link above). For a good summary try teacherpensions.org. Though the article's focus is California pensions it is important to note the differences in the state to state differences- closed versus open retirement systems. As a Florida retired teacher, we pay into and are set up to receive Social Security, unlike the scenario in the article; however, consider too that it is stated a "years 32-37 teachers receive pension commitments virtually equivalent to their full salary". While many California teachers may not qualify for Social Security, the "closed system" benefits them substantially. Florida teachers hired before 7/1/2011 working 32-37 years earn up to a maximum of 55% of their 5 highest averaged salaries and, unless they started teaching at 25+, will have to wait before seeing any Social Security. Thirty years puts many waiting 10 years or so living on 48-55% of their average or $22-$24K a year for years BEFORE S.S. kicks in. Thanks for this comparison with Florida. The BIG point here is that pension systems can differ a lot, and teachers don't necessarily figure it all out until they are decades into it. Teacher unions spend quite a bit of energy helping their members understand what they have. California has recently made significant changes, and this post is under review for update. Excellent explanation of a complex topic. Trying to get 30 years of middle income work to support 80 years of life is a difficult proposition without rethinking how we finance baseline life costs, like funding getting kids from birth to the job market and managing everyone's health. Esp. as we come to terms with the delta between population growth projections and reality. My office examined retirement plans for all of our workers. Even in 1985 we saw the traditional Defined Benefit plan was not workable- none of us could afford it. Yet, the state legislators went ahead with this idea that the market investments would magically make everything easy & there would be no need to raise taxes or contributions. They were and are wrong. We need to get used to pay as we go rather than always hoping for manna. "As employers, districts previously contributed the equivalent of 8.25% of teacher salaries to STRA, but under the new law that will eventually rise to 19.1%." That is a HUGE increase!